Background: Dengue virus (DENV) has become a crucial health concern. The NS2B/NS3 Protease is a major drug target for DENV in rational drug design. At present, effective treatment of DENV is not possible due to unavailability of specific anti-viral drugs. Based on the drug repurposing studies, bromocriptine compound was found to be a potent anti-DENV drug-like compound and it is also an approved drug for treatment of other diseases. 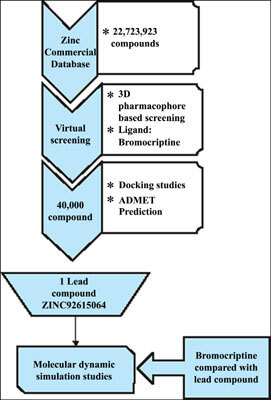 Materials and Methods: Taking bromocriptine as a lead compound, in the current research, pharmacophore feature based virtual screening was performed to find an effective target specific protease inhibitors. Results: Out of 40,000 bromocriptine similar compounds screened against NS2B/NS3 protease drug target, the ZINC92615064 compound was found to be highly potent compared to bromocriptine based on its compared binding energies and ADMET properties. To further validate the results, molecular dynamic simulations for NS2B/NS3 protease in complex with bromocriptine compared to NS2B/NS3 protease in complex with ZINC92615064 were performed for 20 nanoseconds for understanding its plausible mode of action. Conclusion: The outcome of the present study exposed several potent dengue NS2B/NS3 protease inhibitors which are worth considering for further clinical studies. Dengue NS2B/NS3 protease, virtual highthroughputscreening, bromocriptine, ZINC92615064, pharmacophoremodelling, de novo simulation.